What a treat and day of surprises this week’s visit to Brewery Cantillon was. Not only the Fou Foune was sitting on the shelves, but also the Cuvée de Gilloise and the elderberry-Lambic Mamouche was out. Of course I couldn’t wait to try out the new apricot-Lambic that was -without saying- super tart with a super smooth & fruity aftertaste. The numbers of the Fou Foune that are available are very limited, but I’ll be able to re-stock in the coming weeks, so check back regulary to find out for new deliveries. As I mentioned in my previous blog-post I try to supply as many people as possible. The Saint-Gilloise and the Mamouche are as of now available on the shop. Good news from Brasserie Cantillon !! 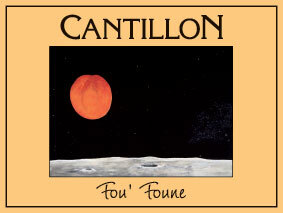 The news is out, Jean Van Roy has finally decided the time is ripe to release this year’s Cantillon Fou Foune. Fruit-Lambic & Cantillon fans alike are welcoming this release, which has been watched out for by many in Belgium and many more abroad. Belgiuminabox will be at Brewery Cantillon this Wednesday and coming week-end. I will post an update on my blogpost on availability and pricing of this epic brew. Belgiuminabox as is Cantillon wants to be able to satisfy as many customers as possible. Unfortunately the appetite for the Cantillon Fou Foune is much bigger than it’s supply will ever be. True Cantillon and Lambic-fans already know this. 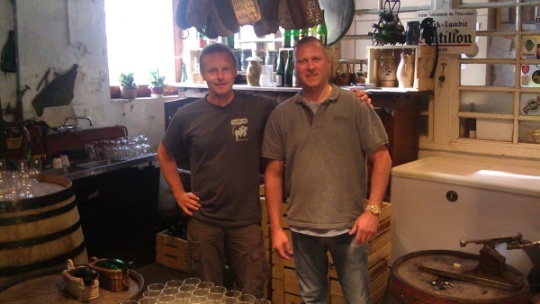 September 2nd I was a visitor at the Open Beer Days @ Brouwerij 3 Fonteinen in Beersel. The main streets of Beersel were packed with people taking part in the yearly walking & cycling evant called “de Gordel”. After 2 very busy days of people visiting the brewery on Friday and Saterday, the croud today was more manageable, much to the delight to the folks at the brewery. The atmosphere on Armand’s courtyard was pleasant, especially in the September sun. 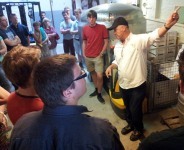 Armand himself was in his element and was doing tours to show his new brewing installation. Armand is the master-brewer, but also a master-speaker when it comes to talk about the past, the present and the future of his geuze brewery. Annecdotes from back in the day and brewing techniques were explained in plain language to understand to the novice and experienced lambic-fan alike. I tasted 7 month young Boon lambic on draught from an Armand recipe/signature. Later I shared a Geuze and the Zwet.be with some Dutch visitors from brewery De Dochter van de Korenaar. 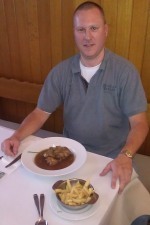 I am now writing this blogpost from Restaurant 3 Fonteinen, which is just round the corner of the brewery. Armands brother, Guido is the restaurants propietor. The Belgian mussels are now in season and the 1.3 kg pot of “Mussels cooked in 3 Fonteinen Geuze” are fabulous. I can only recommend Guido Debelder’s restaurant to anyone that wants to visit the brewery, he certainly knows how to do food pairing with the 3 Fonteinen brews. My day here at Beersel was a treat. Kurt @ Beersel Sept 2 2012. 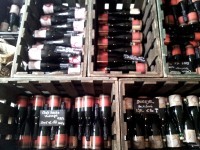 Ps: Check out the webshop to find out what 3 F Vintages and aged brews I found at the brewery!